Any Acoustic Guillotine show is worth attending strictly for their unique brand of stripped down metal. Billy Mackenzie’s trademark giant bass cabinet and Pete Rohrbough’s inventive, almost jazzy drumming meld together into a nimble, scary kind of monster. But beyond the musical reasons for going, Billy and Pete have hard music careers in Iowa City going back over 20 years, so an Acoustic Guillotine show is a place where all the long time musicians and fans come together to compare war stories. The Trumpet Blossom usually hosts quieter music using minimal sound reinforcement, so it should be fun to see these guys rattle the walls. 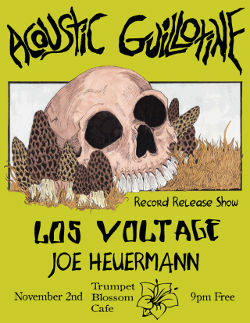 Opening for Acoustic Guillotine are Los Voltage and J. Heuermann.